Dark brown polished marble, highly variegated with elegant white veins and subtle gold tracery. 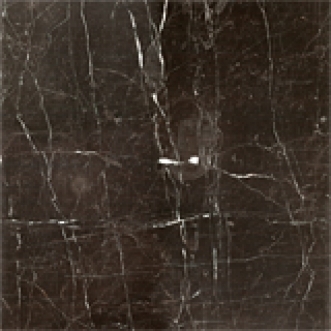 This marble is bonded to porcelain in 1.2cm thickness. Polished marble surface, 3mm thick, Unglazed porcelain base, 9 mm thick. Light commercial and residential interior floors and walls. POLISHED MARBLE SHOULD BE SEALED WITH A PENETRATING SEALER BEFORE GROUTING.